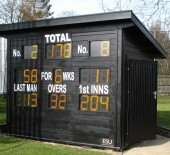 In 2013 ESU supplied Bedford School with a scoreboard to replace one which they had purchased from another company that had never worked properly. The school was impressed with the quality and service provided by ESU, so when they decided that they wanted a scoreboard for their second XI pitch, they naturally contacted us. The school considered a self contained unit in an aluminium enclosure, but after discussion ESU were able to provide a bespoke solution that could be incorporated into a timber building to provide much needed additional storage for the sports department and grounds staff.